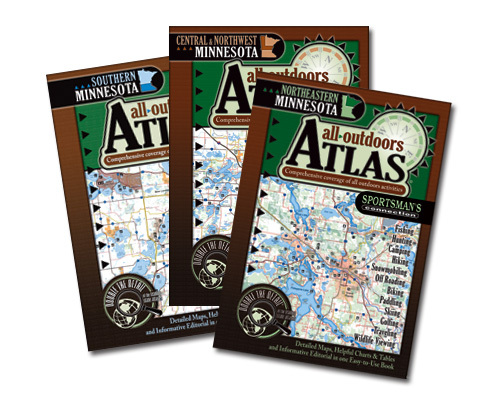 Sportsman's Connection has published compilations of lake maps and fishing information since 1992, and is the leading publisher of fishing map books for anglers across 12 states We have also unveiled our new line of All-Outdoors Atlases & Field Guides, providing twice the detail as the leading atlases, and useful information on all outdoor activities! 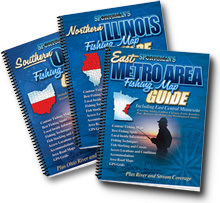 Our Fishing Map Guides and All-Outdoors Atlases give you more quality maps and information for your dollar, and are available at leading sporting goods retailers and department stores throughout the region. Additional states are being developed and will be available in upcoming months. Follow us on Facebook: Illinois, Indiana, Iowa, Kentucky, Michigan, Minnesota, Missouri, New York, Ohio, Pennsylvania, South Dakota, Tennessee, and Wisconsin. Have Questions? Please see our FAQs page. We provide the "Lake of the Week" feature on the back-cover of the Outdoor News in Minnesota, Michigan, Wisconsin, New York, Ohio, and Illinois.